Having already worked one grand slam miracle as an Angel, David Eckstein performed another for the Cardinals. On Aug. 7, 2005, Eckstein hit a walkoff grand slam in the bottom of the ninth inning against Chris Reitsma, lifting the Cardinals to a 5-3 victory over the Braves. “Every once in a while, you get a miracle like this,” Cardinals manager Tony La Russa told the St. Louis Post-Dispatch. The feat seemed miraculous because Eckstein, 5-foot-6 and slightly built, appeared better suited for singles than slugging and because walkoff grand slams rarely occurred for the Cardinals. Eckstein’s was the eighth walkoff grand slam in Cardinals history and their first in 18 years. However, the feat wasn’t a first for Eckstein. Three years earlier, on April 28, 2002, Eckstein hit a walkoff grand slam for the Angels against Pedro Borbon of the Blue Jays. It was one of three grand slams Eckstein hit for the Angels that season. Eckstein’s grand slam for the Cardinals against the Braves was the fourth and last of his big-league career. The Braves scored a run in the top of the ninth against Jason Isringhausen, extending their lead from 2-1 to 3-1. Reitsma, a right-hander who had yielded one run over his last 11 appearances and had converted nine consecutive save opportunities, was the choice of Braves manager Bobby Cox to pitch the bottom of the ninth. Each of the first three Cardinals batters _ Abraham Nunez, So Taguchi and Hector Luna _ singled with two strikes, loading the bases with none out. Nunez, subbing for injured Scott Rolen, hit a groundball single to center and Taguchi, subbing for injured Larry Walker, followed with a low liner up the middle. Luna, pinch-hitting for catcher Mike Mahoney, who was subbing for injured Yadier Molina, slapped a grounder that deflected off Reitsma’s glove toward second baseman Marcus Giles. As Taguchi dashed in front of him, Giles tried to scoop the ball and swipe Taguchi with a tag, but he couldn’t get a handle on the ball and all the runners were safe on what was ruled an infield hit. With the bases loaded and none out, La Russa called for Scott Seabol to bat for pitcher Ray King. Seabol, who hadn’t produced a hit for the Cardinals since June 21, popped out to third baseman Wilson Betemit. 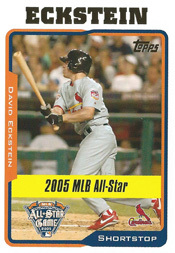 Next up was Eckstein, who had hit four home runs on the season and 21 since entering the major leagues in 2001. After being mobbed by his teammates at the plate, Eckstein doffed his helmet to the crowd of 47,714 who had turned out on what the Cardinals promoted as Transplant Awareness Day. Eckstein’s father was scheduled to become the fourth family member to receive a kidney transplant.